Summary: Take a look at the research that has been done into determining which Twitter posts come from Trump himself and which ones come from his campaign personnel. 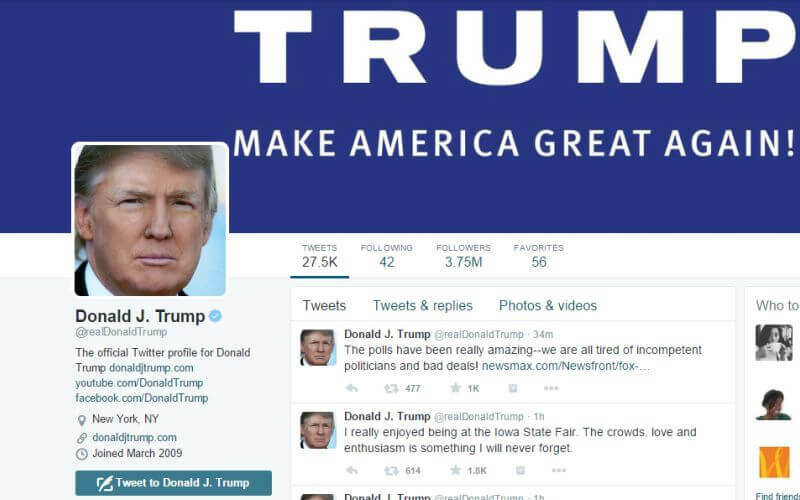 Serious analysis has been conducted into the difference between Republican presidential candidate Donald Trump’s Twitter posts. Some of his tweets come from an iPhone while others come from an Android. While it is not completely unreasonable to think that Trump owns more than one phone, there are significant differences between the tweets that come from the different sources. The tweets posted from the Android and iPhone come at different times of the day, with different hashtags, links, and retweets. The Android posts – Trump in fact does own a Samsung Galaxy – tend to be negative in context compared to the iPhone posts, which is generally just pictures and broad announcements. Read Trump Not a Fan of Justice Ruth Bader Ginsburg. The examination of the data posted under Trump’s Twitter account show that there have been 628 tweets from an iPhone and 762 posts from an Android. The Android posts are done more often in the morning while the iPhone posts are done in the afternoon and early evening. The Android retweets appear as copy-pasting the text surrounded by quotations. The iPhone tweets are 38 times more likely to contain a picture or link. All of these factors could be coincidence but the context of the tweets is the final difference. The posts that came from the Android focus on Hillary Clinton, his campaign, corruption, and his slogan “Make American Great Again.” The choices of words by the iPhone account tend to stick to hashtags related to the campaign. More emotionally charged words come from the Android source. See Tweet Like the Donald. All of this comes as no big surprise. Besides, isn’t this the job of social media campaign managers and public relations representatives? Trump is far too busy and self-important to spend his time posting announcements to remind people to attend his rally the next day. Do you think it is safe to say that the Android posts come from Trump while the iPhone posts come from a member of his campaign? Tell us in the comments below. To learn more about Donald Trump’s campaign, read Lawsuit: Donald Trump’s Campaign Director Pulled Gun on Five Workers.